In “How to Spin the Science News,” Charles Seife criticizes the practices of close-hold embargoes—in which sources for an article restrict access to particular publications and require that reporters not contact other, unapproved sources before a particular date—in science journalism. There are too many pop-science journalists who misconstrue stories. How can scientific institutions ensure that their evidence-based information makes it to the public and that journalists do not prop up a dissenting, unscientific opinion in the name of so-called balance? Perhaps they have found a solution in the close-hold embargo. Seife's examples of embargoes include fairly harmless stories, such as the California Institute of Technology giving particular journalists early access to a new finding because it wanted excellent reporters to cover it. Another is the unrepresentative case of a researcher with a history of bad science—who was not acting as part of a large governmental institution—giving early, close-hold access to a dubious paper. The paper was retracted, as expected. Most of the examples are from the Food and Drug Administration, such as one regarding a laudable antismoking campaign—largely seen as a success—and another listing invited journalists from across the political spectrum, including the Wall Street Journal and Politico. All are from 2014 or earlier, and no evidence is given that the FDA has continued the practice. Can Seife provide any proof that the close-hold embargo has caused real harm or damage outside of hurt pride from excluded journalists? What we need from Scientific American these days is a concerted effort to promote scientific and academic institutions, not demonize them. And we need it to provide factual and evidence-based information rather than speculative conspiracy theories that erode the public's trust in academic pursuits. I cannot think of a more fundamentally distressing situation than the muzzling of the scientific press as described in this article. The close-hold embargo has no place in scientific institutions of the government or academia. SEIFE REPLIES: Cordell's statement that Scientific American needs to make “a concerted effort to promote scientific and academic institutions, not demonize them,” underscores a fundamental disagreement that people have about the role of the press when reporting on science. The implicit, and widely held, argument on one side is that the prime function of the science journalist is to promote the statements of mainstream scientific institutions and scientists, the better to inform the citizenry and defeat pseudoscience. That is a good part of what we do, but it is not our only role. Science journalists are expected to be critical of authorities, whether or not we generally approve of them. It is neither speculative nor conspiratorial to say that even the best scientific institutions operate in a political environment, and when they vie for funding and influence, their goals might diverge from what is best for the populace—and for science. This is the cold reality of what happens when science meets human ambition. Journalists don't serve our readers if we fail to keep check on the institutions that influence our lives and expend our nation's treasure. The degree to which embargoes hamper that second function is a matter of debate even within the science journalism community. But as my article shows, close-hold embargoes influence coverage to the point where correspondents are unable to get independent (and necessary) voices before going to press. Unless journalists have the full freedom to exercise their critical function, they risk becoming little more than glorified public relations professionals. 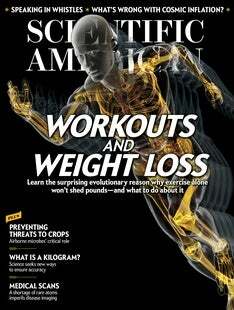 And I truly hope that is not what the vast majority of the audience wants or expects from Scientific American. “The Right Pill for You,” Dina Fine Maron's article on personalized genetic medicine, was a long-overdue breath of fresh air. I would like to add another important use of genetic drug matching, or pharmacogenomics: the possibility of stratifying patients in clinical trials based on their genomic variability. An approach that is limited to the individuals with a high potential to respond to a drug may take far less time and save patients and insurers large sums of money. “Our Senseless Pot Laws,” by Carl Hart [Forum], criticizes the Drug Enforcement Administration for declining to reclassify marijuana from its status as a Schedule I drug, defined as one “with no currently accepted medical use and a high potential for abuse.” That language is at direct odds not only with Hart's and others' cited research on cannabis and its several therapeutic effects but also in ignorance of nontrivial facts from other advanced nations' pharmacopeia. The Schedule I drug diacetylmorphine, or heroin, provides a clear example of the DEA's denial politics. It is called diamorphine in the U.K. and elsewhere. The U.K. has used it for severe pain for decades, and it is still prescribed today. The DEA's claim that it has no medical application ignores a long history of utility and responsible use and aims a slur at responsible practitioners from other nations. The current opiate overdose epidemic in the U.S. is being met with myriad potential remedies, but this effort cannot be successful if the fundamental definitions on which it is based are so devoid of cogent scientific basis. Thank you for pressing the case for the humanities as part of the educational curriculum in “Science Is Not Enough” [Science Agenda]. I am currently winding down a long (40-year) career as a biostatistician. The one skill that was most valued by my various employers over the years was not my mathematics abilities but the fact that I wrote very well. I can thank all of my English teachers for encouraging this. The editors accuse Kentucky governor Matt Bevin of proposing a “STEM-only curriculum” because he advocates state subsidies for students in scientific disciplines and not the humanities. No one is advocating that we abolish the humanities. This is a prudent use of resources to encourage students to pursue a career where their employment prospects are brightest. I say this as the father of a daughter with a master's in anthropology, a mountain of student debt and bleak job opportunities. “Under the Sea of Enceladus,” by Frank Postberg, Gabriel Tobie and Thorsten Dambeck, incorrectly referred to a million kilometers per hour as about 1 percent of light speed. It is 0.1 percent.